If you're ever stuck in a conversation with someone who just won't stop talking, try this easy spell to end the conversation. Take one foot and cross it over your other foot, letting it touch the ground, symbolizing an arc coming to an end. See? Easy peasy! I have only used this spell a couple times, but it worked like magic for me! Unfortunately, I always forget about it while on the receiving end of a heinously boring and long-winded monologue. 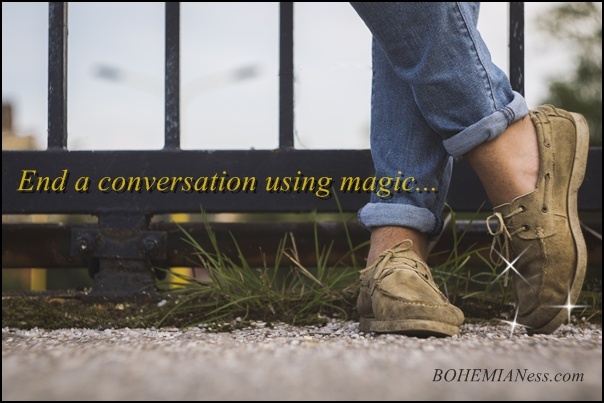 End a boring conversation using magic! I learned this spell years ago, but I can't remember where. I have gone crazy searching my few spell books and everywhere online, in order to credit the source, but I can't find it anywhere. If you know where this spell originated, I would love to hear from you so I can update this post with the appropriate credit, and also so I can stop driving myself crazy with the not-remembering.